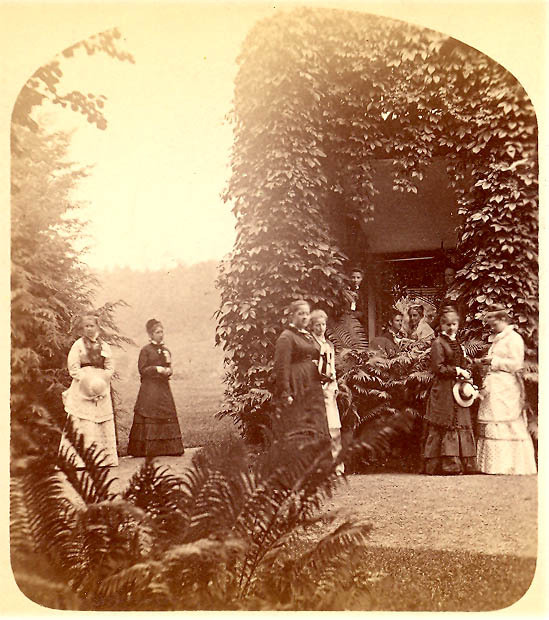 The Howland College Class of 1874 pose at the southeast corner of Mr. Letchworth's Glen Iris. Vines cover the porch pillars, and the large Glen Iris lawn stretches out beyond them. For more detailed information regarding this group, see image 144. This group is also shown in images 33 and 70, making them one the most photographed 19th century group in Park history! The stereoview is from the Clark Rice Collection, Perry Public Library, 70 N Main Street, Perry NY 14530. We thank Peggy Parker at the Library for allowing us to use the image. We also thank Betty Rice for her constant support and assistance.